Milk is a famous skin moisturizer. It also looks so beautiful and serene, so today we will be making a Pure Full Cream soap using Nestle’s brand: Just Milk. 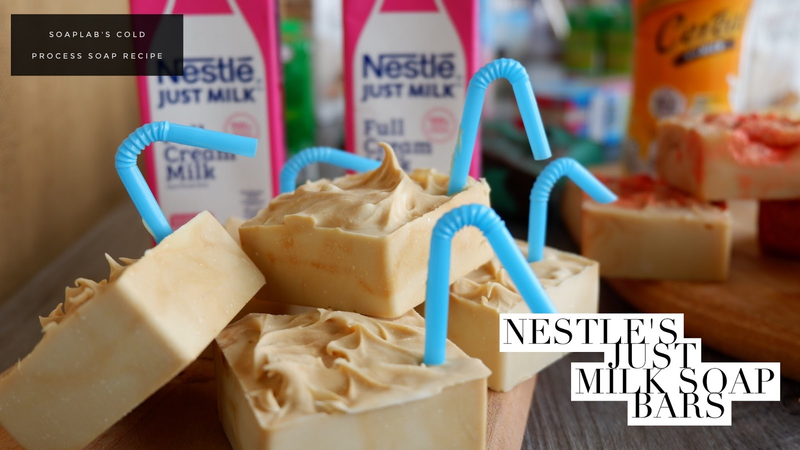 Since incorporating fresh milk into melt and pour soap is not possible because it will get spoilt easily (click here to find out more); we will be using the cold process soap method, so you will need lye, distilled water and an oil mix. Lye is needed in soapmaking for saponification reactions. without lye; its impossible to mix water and oil to produce soap. in this recipe we are using SoapLab’s Oil Mix, The oil mix consists of castor, olive, coconut and palm oil. Each comes with different benefits to make your skin healthy and radiant. For example, palm oil is extremely rich with Vitamin E which is an antioxidant that can treat skin conditions such as acne and eczema. Olive oil is also rich with Vitamin E, providing the skin with anti-aging benefits. For an appetising smell, add crème brûlée fragrance oil before adding titanium dioxide for color. Finally, add Nestle’s Just Milk, for an added boost.